When looking through the list of potential Stopover cities, stopover flights, stopover connections, Jo'burg (or Jozi as it is known locally) probably wouldn't feature too high in the the shortlist. This might be due the city's reputation for crime (indeed the crime level is high, but an anti-crime initiative is clearly starting to work) or the fact that some perceive the city to be a flat, sprawling mass of housing, high walls and satellite dishes. In reality, Johannesburg is a little bit like Los Angeles in look and feel, but without the beach. 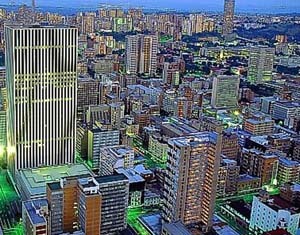 With no stand out 'must do' tourist attraction to recommend it, you have to scratch beneath the surface to discover the fascinating, ever changing metropolis that is today's Jo'burg. The city council's own website is superb and probably the best place to start.